PNY announced the stylish HP v250w USB Flash Drive. 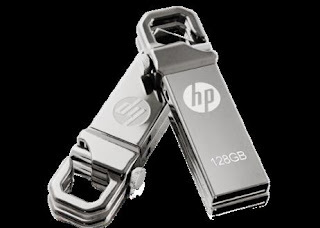 The HP v250w USB Flash Drive is offers a convenient way to back up, store, transfer and carry your digital files anywhere you go. HP v250w incorporates a unique hook and lock design (Patent D724,601S) that ensures maximum security and portable storage for all your entertainment and work files. The HP v250w comes with a high quality silver finish with a smooth metal frame to make it the perfect accessory for the modern and tech savvy world. The drives sturdy design is resilient to external damages and water, which allows you to use the drive during all types of projects. For addition protection, the HP z250w has scratchproof and shockproof against accidental drops or collisions, prevents mechanical shocks, and ensures that the files are protected without damages. The cap less and futuristic design offers easy plug and play operation for fast transfer of data files and media, while making it handier and eliminates the worries of a misplaced cap. The cleverly designed carabineer hook design enables the drive to be securely attached to keys, backpacks, handbags or any other accessory. The HP v250w is the perfect mobile storage for any type of lifestyle. The easy plug and play operation makes it easier to transfer and share files. Simply transfer files to one’s drive, plug the flash drive into the computer's USB port and drag the desired files into the drive's folder. No additional software or drivers are required, so one can begin transferring and backing up the files immediately. It’s ideal for digital documents, picture, video clips and MP3 files. You can store dozens to hundreds of files on this compact drive with storage capabilities ranging from 4GB to 128GB. The HP v250w has ample storage space so you can store you HD files or high resolution images, you favorite movie and music with little to no hassle. Visit http://www.pny.com.tw for more information or to learn more about the entire line-up of PNY products.